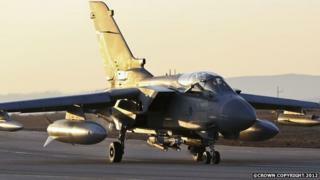 British planes are involved in a third air campaign over Iraq in 23 years. But the RAF has bombed Iraq before - more than 90 years ago - and that controversial strategy has had a huge impact on modern warfare and the Middle East. An armed rebellion in Iraq. Debate at Westminster on how to counter the insurgency. The deployment of RAF bombers to defeat the uprising. With British planes once again in the skies over Iraq, it sounds like a story from the last few days. But Britain first tried to exercise control over Iraq from the air in the 1920s. The end of World War One left Britain and France in command of the Middle East - as the defeated Ottoman Empire fell apart. The allies then carved up the region with a series of "mandates". It gave them control of new countries, with the notion of independence postponed until the peoples of the region were considered ready to rule themselves. One of Britain's mandates was Iraq - Mesopotamia as it was then. But welding together a new country and subjugating disparate ethnic and religious groups who felt that they had simply swapped one imperial Turkish master for another British one proved costly. An uprising in Iraq in May 1920 united Sunni and Shia briefly against the British. It was put down, but required the deployment of more than 100,000 British and Indian troops. Thousands of Arabs were killed. Hundreds of British and Indian soldiers died. The military campaign cost Britain tens of millions of pounds - money it could not afford after the Great War. A new way of controlling Iraq was needed, and the man who needed it most was Winston Churchill. As war secretary in Lloyd George's coalition government, Churchill had to square huge military budget cuts with British determination to maintain a grip on its mandate in Iraq. The result became known as "aerial policing". It was a policy Churchill had first mused on in the House of Commons in March 1920, before the Iraqi uprising had even begun. "It may be possible to effect economies during the course of the present year by holding Mesopotamia through the agency of the Air Force rather than by a military force. It has been pointed out that by your Air Force you have not to hold long lines of communications because the distance would only be one or one-and-a-half hours' flight by aeroplane. It is essential in dealing with Mesopotamia to get the military expenditure down as soon as the present critical state of affairs passes away." The defeat of the Iraqi uprising was credited in part to the deployment of RAF bombers. The embryonic RAF - attempting to carve out a permanent role for itself and avoid being consumed by the other armed services - took on command of all future military operations in Iraq. When troubled flared again, villages held by rebellious tribes were attacked from the air. The Air Minister, Lord Thomson, detailed how one district of "recalcitrant chiefs" was subdued in the Liwa region on the Euphrates in November 1923. He wrote: "As they refused to come in, bombing was then authorised and took place over a period of two days. The surrender of many of the headmen of the offending tribes followed." As far as the British government was concerned, the strategy was a pragmatic success. Iraq was subdued by a handful of RAF squadrons and a small force of troops. The RAF maintained its military control over Iraq until World War Two, even after Iraqi independence in 1932. There was apparently little debate about the morality of bombing. Lord Thomson went on to spell out why air power was essential in Iraq. The language may have changed over the last 90 years, but some of the argument sounds familiar. "The alternatives to the employment of the air arm in backward countries of poor communications and with a wide scattered population are, first, an occupation by ground forces so complete as to put out of the mind of disaffected elements any hope or temptation to resist government authority. Occupation on this scale would involve large numbers of troops and heavy expenditure." For the RAF though, the lessons of Iraq were doctrinal, not budgetary. They came to believe that bombing was enough to win a war. As the historian AJP Taylor put it: "Here was an independent strategy of the air. From this moment, it was accepted that bombs could not only quell tribal revolts, but could win a great war." The "great war" the RAF became convinced it could win by strategic bombing duly arrived in 1939. The lessons of Iraq were to be applied to Germany. One of the RAF squadron leaders in Iraq was Arthur Harris - who in 1942 assumed the leadership of RAF Bomber Command. Several of his senior officers in Bomber Command had served in the same squadron. For Harris, what was true of Iraq was true of Germany. As AJP Taylor said of him: "He genuinely believed that the German people could be cowed from the air as he had once cowed the tribesmen of Irak (sic)." The destruction of Hamburg, Dresden and scores of other German cities and towns followed. Around 600,000 Germans, mostly civilians, perished. But although the crews of Bomber Command fought with great gallantry - more than 55,000 crewmen were killed and 19 Victoria Crosses won - the RAF's strategic bombing campaign alone could not force Germany's surrender. The Allied armies were required to destroy Hitler's war machine. More than 90 years after the RAF's first bombing campaign in Iraq, and 70 years since it flattened German cities in World War Two, does the legacy of "aerial policing" still persist? For some modern historians the answer is an unequivocal yes. They see the US strategy in the Middle East, Afghanistan and Pakistan as the direct descendant of that original British campaign. Prof Priya Satia, associate professor of Modern British History at Stanford University in California, has written extensively about the history of aerial campaigns in the region. "Aerial strategy was developed by the British in the Middle East between World War One and World War Two. A bit of what the Americans do now is borrowed from that experience," she says. "This reflexive recourse to an aerial strategy still in the Middle East is not a coincidence. It comes out of this long history that this part of the world can take it." Satia argues that it was cultural and geographical stereotyping as much as the issue of cost that persuaded Britain that using bombers in Iraq in the 1920s was justified. "They were used in Iraq because there were certain ideas about Iraq. It was perceived as all tribal, all desert, all Bedouin, and that such people and such terrain could take violence that others could not. The assumptions about the people who lived there made it permissible to use planes there." She sees the strongest link in the deployment of drones - used by the US in Yemen, Pakistan and Afghanistan but also now in recent US strikes in Syria and Iraq against Islamic State. "The bombing of Iraq in the 1920s is very similar to what the US drones have done in Yemen and AfPak. It's aerial policing." But there are some that make the case that any calculation about the use of air power alone must take into account modern technology. Collateral damage can be minimised more effectively than ever before, says Elizabeth Quintana, director of military sciences at the Royal United Services Institute. "The UK operates Dual-Mode Brimstone [missiles] which are by far the lowest collateral weapon system in the world and used in the battle for Misrata in Libya," she says. British forces were able to target pro-Gaddafi forces on one street and leave civilians unhurt on a parallel one, she adds. "When you are operating in an area with enemy forces embedded within the local population," says Quintana, "then having a system that can be very precise is obviously advantageous." But airstrikes alone are always unlikely to be sufficient, Quintana says. Satia is dismissive of the argument that today's aerial attacks are different because they are precise. "There's always collateral damage, no matter how precise it is. Reports show that the designation 'militant' has been used much too freely. Secrecy surrounding strikes fuels suspicions of high casualties. The strategy creates anger and new recruits." Yet there have been many who have backed drone strikes for the damage done to al-Qaeda's leadership. And strikes against IS seem a sensible option to many. "If applied robustly and persistently, modern airpower can inflict a debilitating sense of helplessness on adversaries like ISIS, who lack effective air defences," says former major general of the US Air Force Charlie Dunlap Jr, now a law professor at Duke University. "They can become more concerned about hiding from airstrikes in order to simply survive than about wreaking havoc." "It is fair to say that ISIS has not yet felt the full potential of coalition airpower," he continues. "If a fully-resourced and truly determined air campaign takes place, the kind of ISIS that we will see in the future will likely be one that Kurdish, Iraqi, and Syrian opposition ground forces will have the capacity to effectively confront and dispatch." Britain's aerial policing may have long faded from memories in the UK - partly, argues Satia, because of censorship at the time and "myth-making" about it. That's not the case in Iraq, she says. "What happened in the 1920s does still come up a lot. Shia Mullahs will say 'This is just like 1920 again'."